Deb's Cup of Tea: "And in the morning, I'm makin' waffles!" As of 11 a.m., I have no idea how much snow is outside. One report says 24 inches fell in my area. I don't know. I just know that this was the perfect morning to get out the waffle iron. I was a bit dusty. I haven't used it in months. A quick wipe off both exterior and interior and I was ready to go. It comes with several good recipes so there was no digging in the cookbooks or the recipe box for something that might be good. I even added 1 ounce of melted semisweet chocolate morsels to the batter. We've had this waffle iron for 20 years now. It's been a good work horse of an appliance, not to mention, it's just cool. Yes, that is Mickey Mouse. 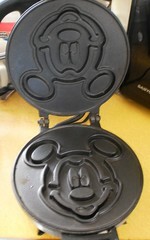 We got this when we went to Walt Disney World in December of 1990. 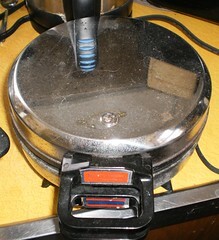 We didn't have a waffle iron at the time. This was $40 which was probably a high cost back then for something like this. But the cool factor doesn't have a price. 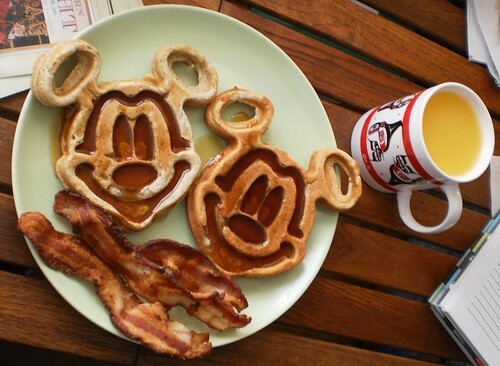 Over the years, it has been a lot of fun to make Mickey-shaped waffles and then decide how best to eat them. A bit over a third of a cup of batter makes the best size waffles. I can't remember without trial and error and it's not written in the recipe or instructions for the iron. A half cup oozed out all over and made a mess so I went with a generous third of a cup. I forgot to grease the iron before doing the first waffle. While this is a non-stick coating, I have to grease it anyway or the waffle sticks. The first one done was not pleasant. There you have today's breakfast. The amount of batter created made a stack of 10 waffles. 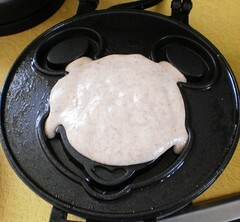 I'll freeze those in packets of 2 and, along with the pancakes made before, have plenty of suitable breakfast items. There are still muffins in the freezer, too. It was a really good breakfast and the company was nice. She thinks she wants this. I gave her a sniff of bacon and she turned up her nose. 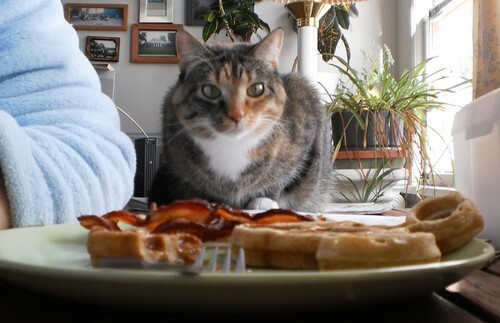 She was also not interested in pancakes or the residual syrup on the plate. I kept telling her there wasn't anything for cats, but she won't believe me until she has her own smell. And the title of this post is a quote from Shrek, in case you didn't recognize it.